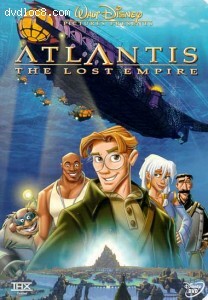 This page contains easter eggs for the disc Atlantis: The Lost Empire (DVD, Region 1). On the main menu select the "Explore" option. There highlight "Animation Production" and point arrow to the RIGHT, and you will highlight the hidden feature of the DVD's credits. Press ENTER to view them. No one has confirmed that this easter egg is valid, while 1 person has confirmed that this easter egg is invalid.